"We're just two lost souls. 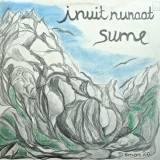 Swimming in a fish bowl, Year after year"
Inuit Nunaat (this album) (1974). Sorry, no matches on eBay for "Inuit Nunaat / Menneskenes Lande Sume".